Alec Norris is the youngest actor to tackle all 34 characters in Doug Wright’s Pulitzer Prize winning play, I Am My Own Wife. Los Angeles, CA, January 21, 2019 --(PR.com)-- The Pulitzer and Tony Award-winning play I Am My Own Wife, by Doug Wright, opens February 1st at Beverly Hills Playhouse, 254 S. Robertson Blvd., Beverly Hills, CA 90211. The play stars Alec Norris and directed by Michael Yavnieli. It was a privilege, being a fly on the wall during one of the rehearsals, during an early morning at Beverly Hills Playhouse. Nestled in an unassuming atrium off Robertson, experiencing the distinct sense that access to a great secret was being revealed. It was. What transpired was so far removed from a typical Los Angeles experience, it was like getting a glimpse of some kind of secret artists’ cove, where the real work happens. Alec Norris, age 22, makes a notable diversion from many other renditions of this famously challenging piece, being one of the youngest to ever tackle all 34 characters in the play. The originator of the role on Broadway, Jefferson Mays, who was 37 at the time, won the Tony Award for Best Actor in a Play for his work in the piece, so the shoes to fill are daunting. Norris’ attitude is grounded and seems up to the challenge: “I’d rather let the work speak for itself. I don’t want to be one of those actors that talks about the intimate details, about the process, I don’t want to do talkbacks after the show. I just want to put the work out there, give the audience experience, and let the story do what it will.” His focus remains on the work. A unique difference to the many young talents pulled further and further away from the work, by the ritzy Hollywood lifestyle. “Every once in a while, a young actor comes along and you take notice. There’s a rare mix of talent, work ethic, focus, and genuine love of craft, that gives you this understanding. It’s a beautiful thing, and it’s not common. Alec has it in droves.” – Faye Viviana, Producer. Each character crafted with the physical, vocal and emotional detail one might expect to see at the West End in London, or by a seasoned Broadway veteran. Norris delivers for the next generation. 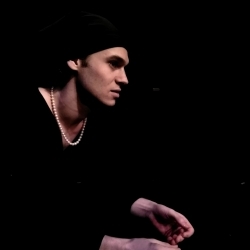 I Am My Own Wife by Doug Wright is a play about antiquarian Charlotte von Mahsldorf, born Lothar Berfelde, who survived the Nazi and Communist regimes in East Berlin, and has become a symbol of strength in the face of oppression for the Queer community.